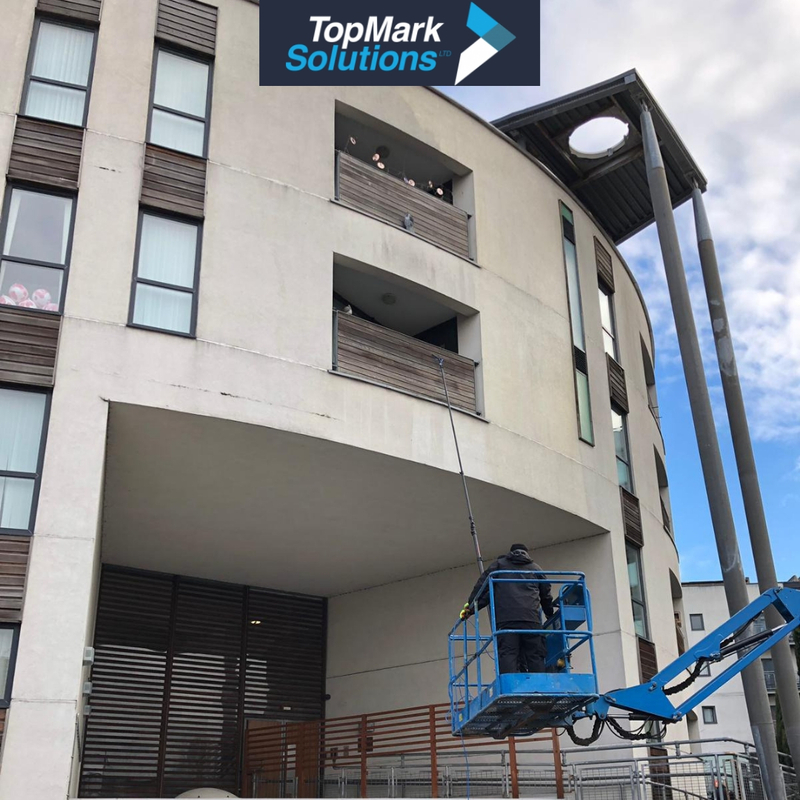 TopMark Solutions work with property management companies on planned and reactive maintenance to keep rental properties of all kinds at their best, improving safety, maximising rents and reducing void periods. Whether you’re looking to give your tenants good value for their maintenance fee, keep your premises appealing for new viewings, or just bring things back to a good state of repair, we can help. TopMark Solutions employees come with the necessary PPE (personal protective equipment) to carry out jobs safely in areas where residents may be passing close by. We also have branded fleet vehicles and uniform bearing the TopMark Solutions logo – so you and your residents can see at a glance that we are authorised to be there and to carry out the work. Render cleaning for apartment blocks and blocks of flats is a large-scale job, but with our high-tech equipment it is faster, safer and more resource efficient. Our technology uses less water to achieve the best results. This is possible by pressurising and heating the water, and it’s not only better for the environment, but also reduces the extra water going into your drains. Our high-reach gutter clearance tools mean we can safely remove debris and blockages from guttering up to 40 ft (12 metres) above ground level. We can also ensure drainpipes are free-flowing and remove debris from rainwater hoppers and sumps, valley and parapet gutters, and ground-level gullies. If you have the land for it, residents now expect on-site parking – and ideally numbered and designated parking bays to avoid conflict with neighbours. We can provide thermoplastic line marking for resident car parks, as well as adding any lettering and numbers to designated spaces, reserved bays for emergency vehicles and maintenance workers, no-parking areas and so on. Finally in an emergency or following weather damage, wear and tear or some other breakage, we can provide reactive maintenance services to repair fixtures like fences, railings, paving and so on. We offer a 365-day call-out service and our team includes qualified electricians, carpenters, painters and decorators, allowing us to quickly make safe any dangerous areas and put right the damage.